Most of the year 1940 proved to be a busy time for Simenon, but not in terms of his writing. After writing La Maison du Juge (Maigret in Exile) by the end of January of that year, he produced only three more novels and the start of an autobiography. At the beginning of May he wrote the novel La Veuve Couderc (Ticket of Leave), but during the same month as the Second World War was developing, the Netherlands, Belgium and Luxembourg were invaded. Determined to be involved in some way, Simenon travelled to Paris to the Belgian Embassy and soon found himself designated as "High Commissioner for Belgian refugees for the Département of Charente-Inférieure (now Charente-Maritime)" in the south-west of France where he had his home. Simenon still had Belgian citizenship and was to retain it throughout his life. During the year 1941 Simenon wrote nine short stories, four novels (including one Maigret), finished his autobiography Je me souviens and completed the first part of its successor, the novel Pedigree. Living in the town of Fontenay-le-Comte (Vendée) he grew to dislike the rented house in which he was living, so negotiated to rent some accommodation in the Château de Terre-Neuve from its owner Comte Alain Du Fontenioux. Just on the edge of the town, this chateau dating from the sixteenth century (with mid-nineteenth century restoration and additions) provided Simenon with more space and facilities. 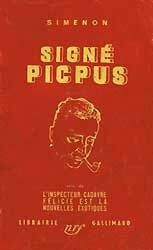 The Maigret novel that he wrote was Signé Picpus. The last sentence in the form of a question is very much an understatement, as Simenon wrote the novel in June 1941, weeks before the newspaper Paris-Soir proposed the “competition”. It would be very interesting to be able to consult the relevant editions of Paris-Soir of the period in order to read exactly how the newspaper presented the “competition” to its readers. Simenon was not unfamiliar with his work being the object of reader participation. When he wrote the three sets of short stories, Les Treize Mystères, Les Treize Énigmes and Les Treize Coupables for the weekly magazine “Détective” between 1928 and 1930 under the pseudonym Georges Sim, reader participation was involved. Initially when the magazine published each of the 39 short stories, the dénouement was omitted. Readers were invited to submit to the magazine what they thought the solution to each short story should be. Any reader whose dénouement was the same as the author’s was awarded a cash prize. The magazine published Simenon’s dénouement a fortnight later. Having acquired a reputation for producing novels within a remarkably short time, Simenon, then generally know as Georges Sim, in January 1927 was offered a challenge. Eugène Merle, the proprietor of the newspaper Paris-Matin, drew up a contract challenging Georges Sim to write a novel in a week whilst he remained in a glass case located in front of the Moulin Rouge in the Place Blanche in Paris. The readers of the newspaper would choose the theme, the title and the characters of the novel, but in spite of much publicity, this event did not take place. In 1941 another work by Georges Simenon was the subject of a newspaper “competition”. Several of his works had been serialised by Paris-Soir, the last being Cécile est Morte (Maigret and the Spinster) published in 45 instalments between February and April 1941. But the reader participation with Signé Picpus was different in the circumstances. Simenon had already written the novel in June 1941 whilst Paris-Soir did not broach the subject of the “competition” until November. Presumably the newspaper would have been in possession of the author’s manuscript some time beforehand. The reason for involving the newspaper’s readers in this curious way is a matter of conjecture apart from publicising the novel and to sell more copies of Paris-Soir. As France was under wartime conditions, perhaps the newspaper wished to create a diversion, a form of escapism, to distract their readers, for a time at least, away from the daily news of the conflict. A curious newspaper event which does not appear to be mentioned elsewhere. Paris-Soir serialised Signé Picpus in 34 instalments between the 11th of December 1941 and the 21st of January 1942. 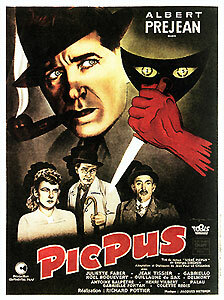 Signé Picpus is set mainly in Paris, and of the locations Simenon uses two familiar addresses. At the very beginning of the novel, Joseph Mascouvin, who alerts Maigret to a crime that is to be committed, lives in a two-roomed flat at 21 Place des Vosges (3rd arrondissement). This address is where the author lived mainly between 1924 and 1929, and it is where Maigret and his wife were living, temporarily, in the short story L’Amoureux de Madame Maigret (The Stronger Vessel/ Madame Maigret’s Admirer). The crime is committed at 67 Rue Caulaincourt (18th arrondissement), that is in the English translation, but Simenon’s text gives the number as 67bis (which does not exist). But the author has used this address, 67 or 67bis, several times, as the home of Lulu the mistress of Jean Cholet in the novel L’Ane Rouge (The Nightclub), for the dressmaker Gabrielle Vivien in Maigret et l’Homme tout seul (Maigret and the Loner) and in the short story Mademoiselle Berthe et son Amant (Maigret and the Frightened Dressmaker/ Mademoiselle Berthe and her Lover) among others. 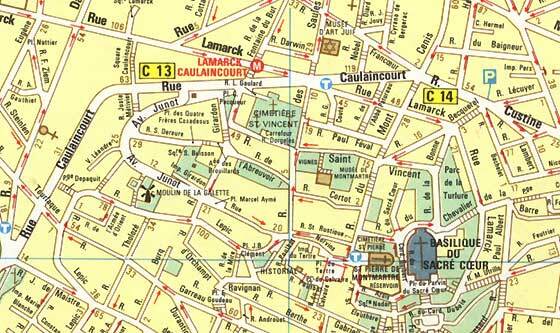 In fact N° 67 is not opposite the Place Constantin-Pecqueur as mentioned in the text, but near the Square Caulaincourt. As with many areas of Paris, Simenon knew this other side of the hill of Montmartre very well. It was in a café opposite the Place Constantin-Pecqueur that in 1924 he wrote his first novel Le Roman d’une dactylo (The Typist’s Novel  not translated) under the pseudonym Jean du Perry, whilst his wife Tigy was exhibiting her paintings in the Place Constantin-Pecqueur with other artists. A long-time friend from Liège, Luc Lafnet, who had studied painting with Tigy at the Académie des Beaux-Arts in their home city, lived in the Rue Lepic and later in the Rue du Mont-Cenis in this same area. In Signé Picpus a certain Madame Roy, who discovered the crime, ran a hotel at Morsang-sur-Seine (Essonne). It was in 1930 and again in 1931 that Simenon moored his boat, the Ostrogoth, along the Seine near Morsang where he came to know a riverside inn and hotel named the Vieux-Garçon which fits the description of Madame Roy’s Beau-Pigeon, and where a curious Maigret and his wife spent a weekend. In using these three locations, the Place des Vosges, the Rue Caulaincourt and Morsang-sur-Seine, was the author being expedient or did he have a touch of nostalgia? For the first three quarters of the novel, the pace is steady, with Maigret interviewing various people either in his office, at their homes or other locations, and at times, with certain individuals, being faced with obstinacy, stubbornness or even a wall of silence. But in the last quarter something sparks in Maigret’s mind that makes life hectic for him as he unfolds a conspiracy of deception, fraud and blackmail. The only English translation of this novel is by Geoffrey Sainsbury who treats Simenon’s French text in a wayward fashion, with additions, omissions and alterations. For example, early in chapter 2 when Maigret is accompanying Octave Le Cloaguen in a taxi from the Quai des Orfévres to the Boulevard des Batignolles, Simenon uses one route whilst Sainsbury uses another. A small point, but why change the route, as the main issue of this journey was Maigret observing Le Cloaguen’s reaction as the latter neared his home? 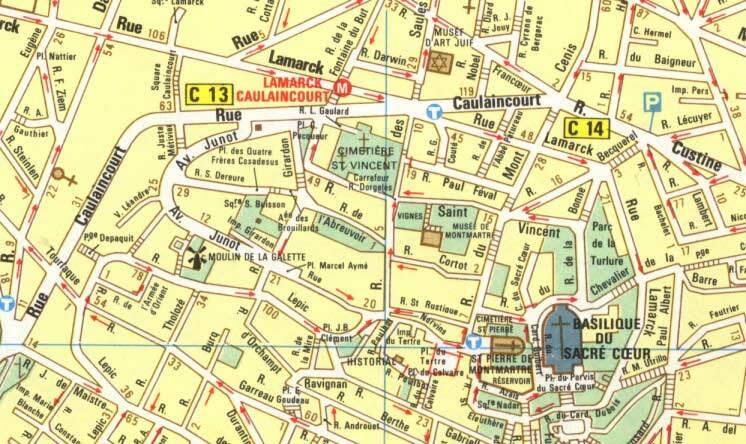 A part of the map of the 18th Arrondissement showing the Rue Caulaincourt and the Place Constantin-Pecqueur. Number 63 Rue Caulaincourt is indicated, making Number 67 close to the Square Caulaincourt instead of being opposite the Place Constantin-Pecqueur. (Paris plan 11, Michelin, 1988). 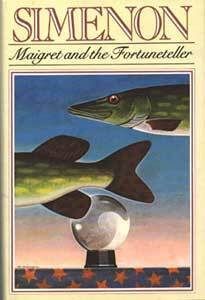 This is one of my favorite Maigret's. Part of that comes from the fact that there are so many different things going on in this story in so many different places. Another reason I like it so much is the part of Paris it is set in. This is a place I've become very familiar with and I can easily relate to the setting. The plot is interesting and holds your attention while the solution is never obvious until the end. It's a great read. What I didn't like was the fact that M Le Clouagen was given short shirft after being a major player for a while in the story. Remember that the murdered fortuneteller was his daughter and although it was mentioned, it was never dwelt on, for example how he felt about her death. Also, his final fate was left out of the story. I figured that he continued living at 13 Boulevard des Batignoles until the two women were released from prison, but afterwards? I suspect as he was no longer needed, he returned to his former life on the streets and under the bridges. At the very end, it was something of a surprize to read that the family that gave the real Dr. Le Clouagen his annuity thought it was something of a joke that they had been defrauded out of a fair amount of money by his wife. See "In the Footsteps of Chief Superintendent Jules Maigret in Montmartre"
Stanley G. Eskin does not hold a very high opinion of Signé Picpus (he calls it "off-the-wall", and I agree with him, so far as the plot is concerned), but he draws a very interesting comparison between it and other Simenons. During Simenon's "apprenticeship" writing pulp fiction, he produced a novel called Nox l'insaissable, published in 1926 in Ferenczi's detective series. It is in the Arsène Lupin tradition, and features a super-detective, Anselme Torres, pitted against a super-thief, Nox. Nox announces ahead of time that he will rob a certain banker, defying anyone to stop him (preannounced crimes occur several times in the Maigrets: L'Affaire Saint-Fiacre, for example, Signé Picpus, and Maigret hésite). Another pre-announced crime appears at the beginning of Death Threats, bringing Maigret into the affairs of M. Émile Grosbois.